After alarming pro-life activists with a public statement that human life begins when the embryo is implanted in the mother’s womb, Republican presidential candidate Newt Gingrich issued a statement on December 3 affirming that life begins at conception. The Republican candidate’s televised remarks shocked and alarmed pro-life advocates. 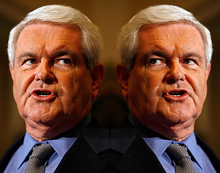 Gingrich has a strong record of opposition to abortion, but his televised statement lent support to the argument commonly raised by advocates of early abortion: that a fertilized human embryo cannot be considered a human life in its earliest days, until it is implanted in the mother’s womb. That argument flies in the face of scientific evidence, since at the time of fertilization a new and distinct human life is formed.